Paribus Review 2019 - Find is paribus safe, legit or scam ? How does paribus work ? Paribus is a new site in town that has managed to grab the attraction of many people on the internet. It is a website that constantly keeps an eye on your online purchases from different online shops and it monitors the price level of the commodities you purchase. Once it detects a fall in the price of the product you have purchased, they will refund you the apparent ‘loss’ you faced because of the price fall. As mentioned earlier, Paribus just tracks the online purchases you do and it monitors the price level of the products after you have purchased. When it detects a fall in price, it calculates the gap between the two prices and refunds you the difference amount. Today, many stores offer customers for a price adjustment. You can get an adjustment in price if the price goes down. Still, this costs a lot of hassle. You need to keep all the memo you have, keep a hawk’s eye on the price level of the products you frequently purchase, notice the price fall, file a refund claim with all necessary documents and what not! Here’s how Paribus comes into play. They do all these tasks on your behalf. Whatever you purchase from online, they will be your advocate to arrange the refund in case of a price cut. Not only on Desktop but also you can also use paribus from your apple phones. Currently paribus app is available only for iOS users, Still paribus is’t available for android users. As an android user mobile browser is the only way to access paribus from your smartphone. Paribus working with so many popular stores. Here are the list of their monitored stores – Amazon, Macy, bestbuy, Newegg, staples, Target, Bonobos, J.crew, Zappos, nordstrom, banana republic, Old navy, GAP, Athleta, walmart, kohl’s, home depot, Sears, crate & barrel, Bed bath & Beyond, REI, Anthropologie, L.L.Bean, Loft, Bloomingdale’s and Wayfair. Not only stores but also paribus track some popular hotel booking sites like – Expedia, hotels.com, booking.com, priceline etc. Amazon does not offer any price protection policy for their users that’s why paribus didn’t work on amazon if their is any price drop. But still if amazon provide a guarantee delivery date and failed to shipped that product on time then paribus will initiate a refund on shipping cost of that order. Sign up paribus with your email id. ( choose that email id from where you regularly purchase from above store). Currently paribus accept gmail, yahoo and outlook mail. After signup give access “paribus receipt fetcher” to connect your account with paribus. Once you link then it will automatically start tracking all of your orders. Payment process is totally depend on retailers. Once any retailers confirm price adjustment then the refund will made within a 3-7 days. Retailers will refund you in form of payment that you use to purchase from your retailers. In one words, refund amount will go straight to your bank accounts . In paribus deals section you will see lots of product deals in one place from different stores. not only they are showing product deals but also they shows a graph chart of product few week price. So by seeing that graph you can easily determine how much you can save on that product. Many people may and have asked this question that is it a scam site cause it sounds like one. Honestly speaking, this is absolutely natural for people to be skeptical. Still, we have gone through the site’s operation and found some useful information. Eric Glyman and Karim Atiyeh kicked off this site back in 2014 and it was later bought by Capital One in the year 2016. It has two platforms. iOS and PC. The Android app has been removed from the play store and it is trying to make it available again on android platform. Although Paribus is a cool idea, this thing comes with some itchy conditions. In order to make Paribus work fully, you need to give it access to your e-mail. Not just to receive e-mail, but to delete and send on your behalf as well. This is needed as Paribus will carry on all the process of refunding your money on your behalf. So gaining access to your e-mail is necessary as you make your online purchases through your e-mail ID. Paribus goes through your e-mails to deep check your previous purchases and it tries to match the current prices of the products you have purchased earlier. This way, it gets easier for Paribus to find out the money you spent above the current price and refund it to you. Moreover, they will file refund claims on your behalf using all the information it finds on your e-mail. For this reason, it is quite necessary for Paribus to gain access to your e-mail which is no surprise. 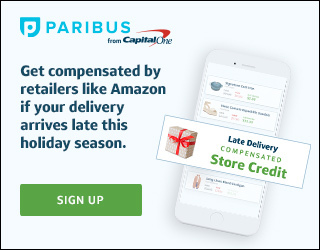 There is an option for you to connect your Credit/Debit card or Amazon card with Paribus for it to work more accurately. If you don’t want it, then it’s ok. It is not necessary. If you have no problem with e-mail security, then it shouldn’t be an issue to you but if you are someone who is really concerned about online privacy, then Paribus may not be the privilege you need to avail. Despite Paribus being a cool site to save money, there are some complaints on the market from its users. Malfunction issue: Some users have complained that they have been using Paribus for a long time now but still haven’t got any refund and money back. This is normal for three reasons. It may be the case that Paribus hasn’t detected any purchase receipt that is eligible for a refund claim. The store where you made your purchase, doesn’t offer any refund on their sales. As Paribus is not the authority who is paying you the refund, it has nothing to do if the shop or store doesn’t allow them for a refund. A technical issue may be there. Paribus is an online based algorithm that works on technical set up. Any glitch or technical malfunction may hamper its smooth operation. In this case, we suggest users file a complaint to Paribus right away. Access to e-mail: Another complaint is that Paribus is taking access to your e-mail with full authority. It can read, send and delete your e-mails once you allow it to use your e-mail ID. If you are concerned about privacy, let us assure that this is not something to worry about. All Paribus do, is look for any purchase receipt you have on your email. If it matches with any product that has seen a price cut recently, it adjusts the balance to your bank account. Still, we suggest you if you are really not comfortable with this authoritative e-mail access, then you should not use this service. Available in the United States and Puerto Rico only: This is sad and true. Paribus is only available at The United States and Puerto Rico. You can’t have this feature and service if you are not living in these lands. Yet, if you are not from these places, you can still get this service from other sites as well. All you need is to just look around you for similar services and you may find one too. This is all we learned about Paribus till now. It still is a great service with all its limitations and problematic issues. If you are a regular online shopper and confident enough with your online privacy, Paribus is definitely a service that will make you money with no practical effort.